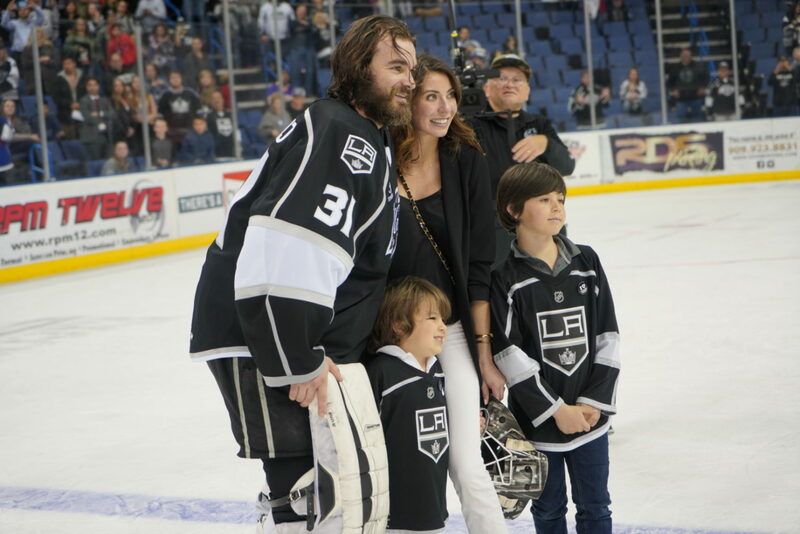 In what was the final game he’ll play at Citizens Business Bank Arena, goaltender Peter Budaj was the love after the game. The fans who left the CBBA tonight, following the Reign’s final home game of the season, probably won’t remember the 4-2 Stockton victory. 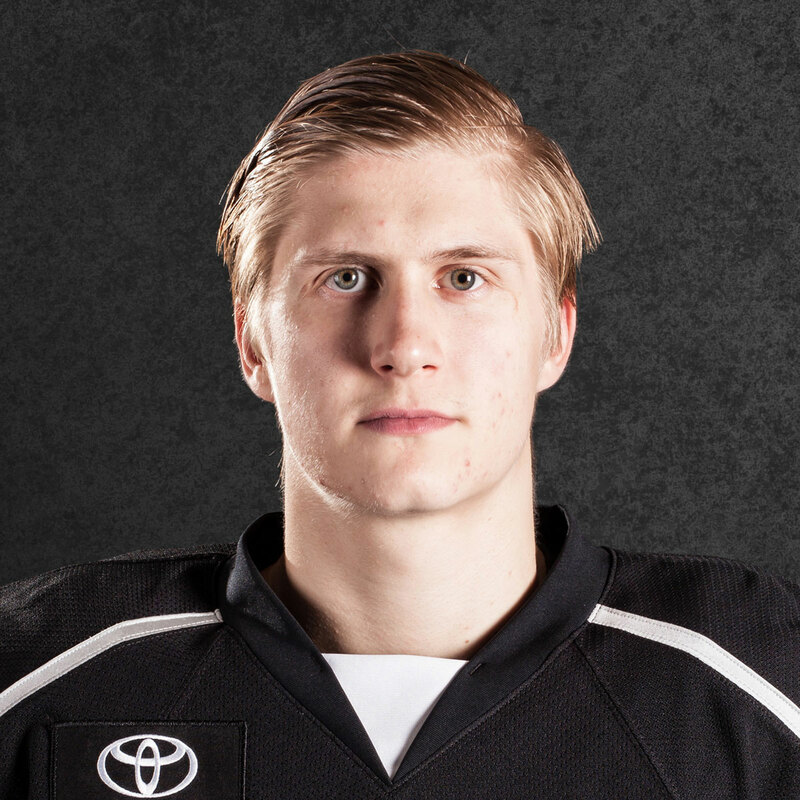 But they’ll be sure to remember one of the most iconic players in Reign franchise history, taking one final lap to a rousing ovation from the Ontario fans. 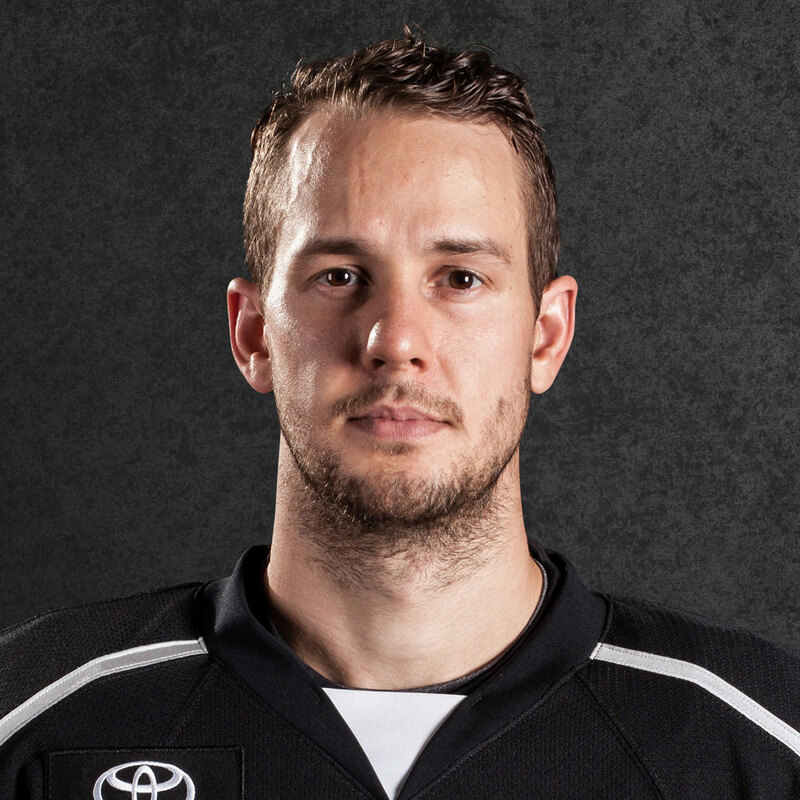 Budaj made 34 saves on 37 shots in what is likely the final game of his professional career. The 36-year-old netminder turned in a workmanlike effort, including a highlight reel double-save midway through the second period, beginning with a a tremendously athletic save with the glove hand. 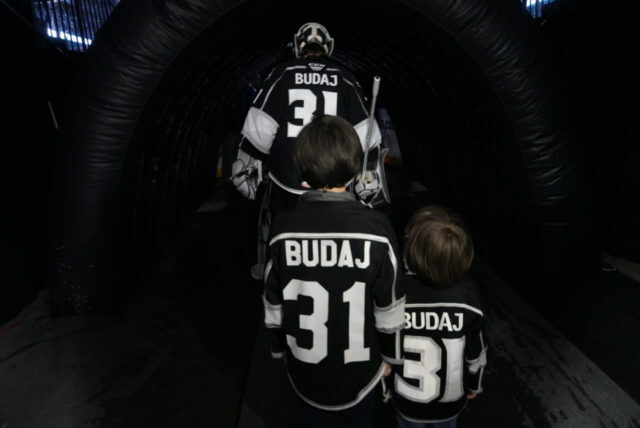 The night started with Budaj’s teammates donning “Budaj 31” T-Shirts before the game during off-ice warmups, a gesture thought of by Reign captain Brett Sutter, executed by Reign equipment manager Luke Eichas. With the veteran goaltender starting for the final time, his kids stood with him during the pre-game ceremony in his final start. 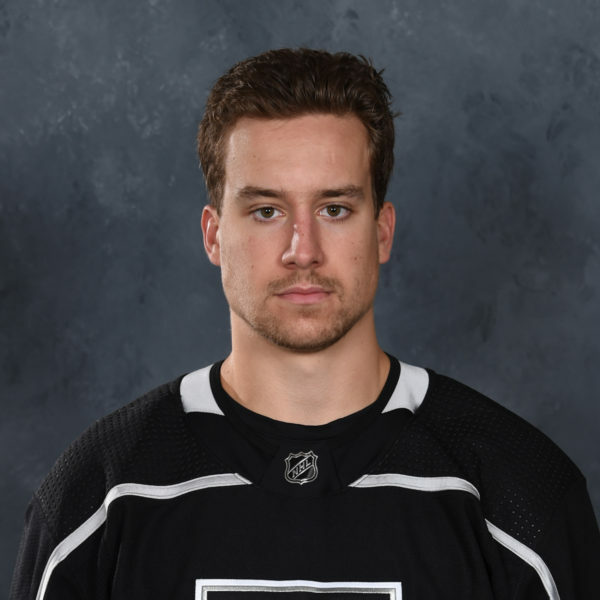 After a pair of early Stockton goals, Budaj held the fort while the Reign stormed back to tie the game at two, via goals from Brett Sutter and Max Gottlieb, before a 2-on-1 goal from Stockton spoiled the fairytale ending, at least on the ice. Immediately following the game, the entire Reign team, along with the coaching and training staffs, remained out on the ice and the bench as Sutter directed the fans to the jumbotron for a video tribute to the winningest goaltender in Reign history. Perhaps a bit of storybook lure after all. Budaj then took a lap of honor, with his wife and kids on the ice with him to help celebrate the moment. 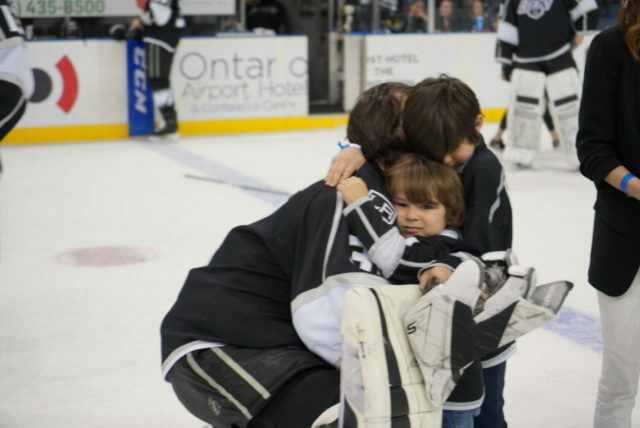 The love between Ontario Reign fans and Budaj was unmistakable as he gave all of his teammates and coaches a hug, before departing the ice for the final time as a professional player, to a standing ovation throughout the arena. 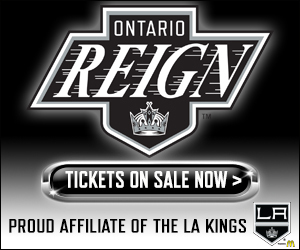 While Budaj’s career ends with a special moment tonight in Ontario, the Reign will play one final game, an evening tilt in Bakersfield tomorrow night at Rabobank Arena. It’s tough. It’s tough to watch…we kind of knew it was coming, but until you look up and you see the jumbotron, you see the reactions of the fans and his teammates…it feels good, but it’s kind of like you don’t want to see a good thing end. Peter, he’s one of the good ones and you know what, he’ll do well, whatever he decides to do. Take some time with his family and his kids and there’s been a lot of miles on him, a lot of travel a lot of movement. Hopefully, with whatever he’s doing next, he’ll be just as happy doing that. Yeah, that’s the beauty of the game of hockey. Everybody appreciates players that have had long and distinguished careers. 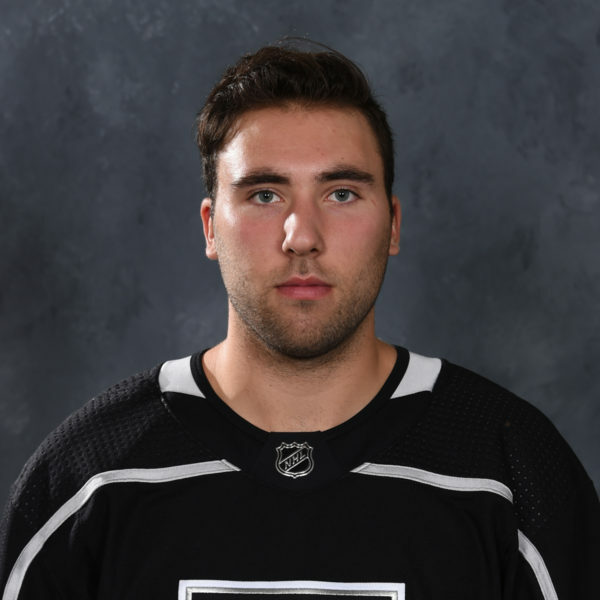 I was getting texts during the game from Paul Bissonnette asking if Buuds was retiring and I’m saying “I’ve got a hockey game to finish.” I’m getting missed calls and Biz is like “oh yeah sorry”. But he’s got it of course, Mr. Social Media, he’s got it out there too. Biz was here, playing with Buuds. He’s one guy I can always talk to and at the end of the day, he’s had a hell of a career. You can’t get a better guy to watch Cal and to be there for Cal. It was great for him to play in front of his family, but it would’ve been better to get the win for him. He’s a standup guy and I don’t think I could have asked for a better veteran back there. It was tremendous. It was great. It was such an honor to have my friends, my teammates, even the other team acknowledge everything, I really appreciated it, it was very nice. To have the video and everything, it makes you sad, a little bit teary eyed, it’s something I’ve done my entire life and we leave everything out there, so it was difficult. Part of everything is starting, beginning and ending, so it’s just an amazing feeling. It was great to have my kids and my wife there, to be able to share it with them, and the memories just kind of kicked in as soon as I started playing. When I was young, my dad took me to an open ice, they didn’t even have a ceiling in the arena, it was open, we’re from a small town. It kicks in, all those memories, the sacrifices everybody else in my life made for me, starting with my family, my parents. All the people that helped me, coaches, strength coaches, staff, my family, my wife and kids. It was just a very emotional moment. That was very unexpected. I was trying to keep it on the down low, I didn’t really tell anybody, and then when we talked, me and Suttsy, when Brett found out he did that for me, it’s such an honor and I appreciate it so much. Even though this year was very difficult for us on the ice, we had a very good group of guys here and we stuck together and it was such a nice gesture, I really appreciate it. This rink is very special for me for many reasons. When I didn’t have anything, this place became my home, in the 2015-16 season. They’re just great fans here that support you. Even today, it was our last game, we haven’t had good results as a team but they show up and they almost pack the building and they supported us. It was a great atmosphere, there’s great fans in Ontario. It’s awesome to play here, it felt really great when they were chanting my name, it gave me a little bit of goosebumps being the last time I was going to play here, it’s a pretty special moment.